A few weeks ago, I spoke with actress and playwright Crystal Roman. Days after our interview, I sat in the audience viewing her theatrical production Black Latina: The Play. The feeling of being “Too black for Latinos and too Latino for blacks” is a sentiment not lost on Crystal. In a case of art imitating life, she penned her experiences as a Black Latina in a play that addresses many of her struggles and triumphs. Crystal’s young life was marked by moments of feeling like an “outsider” or “other.” Her family moved from predominately African American Harlem to living on Staten Island, a primarily white borough of New York City. With this change in residence, certain instances seemed to spark an increasingly disheartening question. As a daughter of a black Puerto Rican mother and a white Puerto Rican father, Crystal was often asked “Where is your mother?” when attending school events. The question was particularly frustrating because her mother was often standing beside her. Many people also voiced their amazement when seeing her mother for the first time. Comments like, “Oh, wow, your mother is black “ were not unusual. According to Crystal, these reactions “made it seem like there was some kind of negative connotation or undertone to my mother.” She says in order to avoid dealing with the question of identity, Crystal decided not to attend high school on Staten Island. Instead, she chose a high school in Manhattan, known for being one of the most racially, ethnically, and linguistically diverse areas in the world. Crystal Roman and her mother, Lisa. Photo courtesy of Crystal Roman. 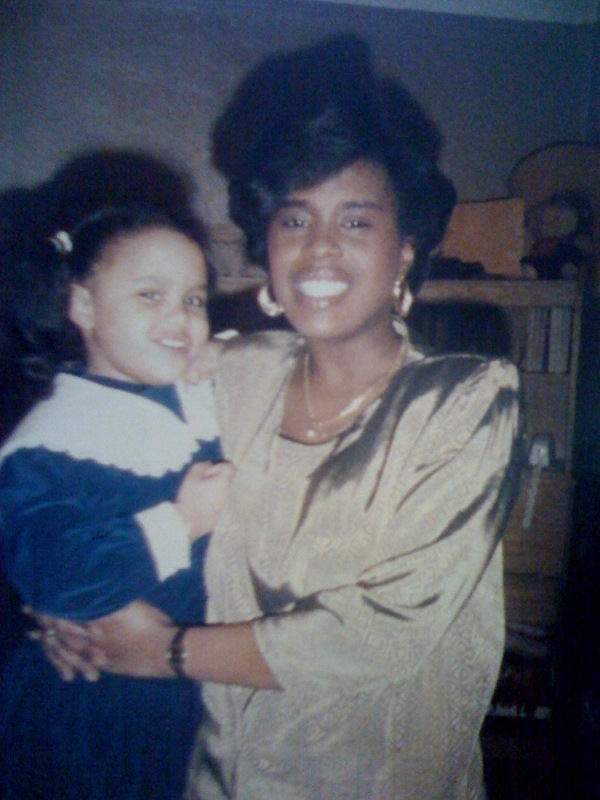 She also confides that her mother, Lisa, was told as a young girl not to “bring a black man home.” Ironically, Lisa married Pedro, whom Crystal describes as, “a black man trapped in a white man’s body.” Speaking of her father, Crystal says he was deeply rooted in African American culture enjoying the music of the Stylistics and Barry White. Her first concert at the famed Apollo theater was with her father. She credits him with her knowledge of African American culture. Growing up with Puerto Rican parents of different races may have been challenging at times. Fast forward several years, now Crystal is a mother of two children. At 30 years of age, she is wise, smart, vivacious and more than prepared to delve into the complex world of culture, race, and ethnicity through her theatrical work. Encouraged by friends to record her feelings, she realized, “I need to write, I need to write something. So, I just buckled down and just started writing. No shape, no form just writing my feelings on a page and it came out to four different characters (representing anger, sadness, love and empowerment). When I was done, it was such a relief, so therapeutic.” Next, she converted the words on the page into a short play. This cathartic workout eventually evolved into Black Latina:The Play. From a sense of imprisonment and confinement, to acceptance and self love, the play shows the evolution of the five “Black Latina” actresses. In an effort to showcase a much more representative group of women, Crystal intentionally casted performers of diverse sizes, heights, weights and skin complexions. Included in the cast of five actresses is Judy Torres, the queen of freestyle music. Whether in English, or several monologues performed in Spanish and Portuguese, reflecting the linguistic diversity of Black Latinas, the actors share many painful moments of feeling like outsiders, unaccepted and lost. 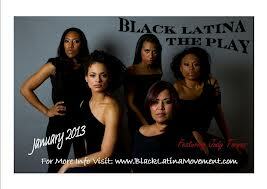 As the play progresses, the protagonists begin to reflect on the accomplishments and contributions of Black Latinas. They acknowledge that the careers of singers like Gloria Estefan and Shakira would not have existed without performers like Celia Cruz. The actresses also delighted in recalling savory African inspired dishes such as candied yams, mofongo and rice and beans, eliciting agreement and laughter from the audience. Somehow, after speaking with Crystal, I get the sense that the actors’ last line is a phrase she has repeated many times to herself. But for Crystal it’s more than a line from the script, it’s a role she’s prepared for her entire life. I LOVE THIS ARTICLE.WILL THIS PLAY BE COMING TO THE PHILADELPHIA AREA? Thank you for stopping by Joseph 🙂 We’re not sure if they have any plans on coming to Philly just yet. I also loved this!! Come to SEATTLE/TACOMA WASHINGTON PLEASE! I feel just like this as a young woman sharing these two identities! I’m sure there are plenty! The 98118 ZIP CODE is the most diverse in the nation! Glad you liked the post. It’s wonderful to know that Crystal’s work is resonating with so many people. Thank you! I feel for you Crystal because in this country if you’re black, you’re black and if you’re white, then you’re white. Everybody knows that latinos are not a race, it’s an ethnicity. As for myself being a black man of Jamaican and Cuban descent, I’m riding with you on this one. Black folks in the U.S. should know that 5% of slaves were brought to the U.S. and 95% of slaves were brought to the Caribbean, Central and South America. Thanks for sharing your thoughts. We are working on bringing more stories of Afro-Latinas like Crystal to our readers, as well as continuously shedding a light on the magnificence of the African Diaspora. I love this article. I’m African-American, but a third-generation–my parents came to America in the 60s/70s from Cameroun. I never knew that there were black people in Latin America (unlike my parents) until I found out in middle school while doing some research on Venezuela. I think that there needs to be a change made in the history books, especially in America, to bridge the divide between people of African descent. It thrills us that you enjoyed this article! We agree that increased information about the African Diaspora is needed. That’s why we started this blog. Your research in middle school was important. In our own individual way, each of us can make a difference. Below is a link to one of our posts from last year. I thought you might find it interesting. It features Afro-Venezuelan historian, Evelyne Laurent-Perrault.